This recipe makes 4 servings with 687 calories, 12g of protein, and 46g of fat each. For $1.45 per serving, this recipe covers 16% of your daily requirements of vitamins and minerals. 1 person has made this recipe and would make it again. It can be enjoyed any time, but it is especially good for Summer. Head to the store and pick up condensed milk, coconut, juice of lime, and a few other things to make it today. From preparation to the plate, this recipe takes roughly 5 hours. It is a good option if you're following a gluten free and vegetarian diet. All things considered, we decided this recipe deserves a spoonacular score of 50%. This score is solid. 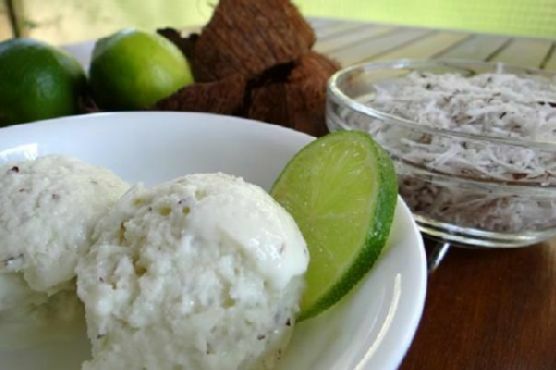 Try Toasted Coconut Cold Brew Bananan Ice Cream, Coconut Lime Cupcakes with Coconut Lime Cream Cheese Frosting, and Lime and Coconut Ice Cream for similar recipes. Using an electric hand mixer, beat together the coconut milk and powdered cream in a large bowl. Beat in the condensed milk, followed by the lime zest and juice (adjust the juice to taste). Last, fold in the grated coconut. Once all your ingredients are combined, pour the mix in your ice cream machine and let churn. If you dont have an ice cream machine, or if your mix is too dense for your machine, place the bowl in the freezer and beat every couple of hours until set (2-3 times). The average fresh lime contains 2 tablespoons of lime juice (just in case you are substituting bottled lime juice).